our condolences to the family of Remus. . may his soul rest in peace. 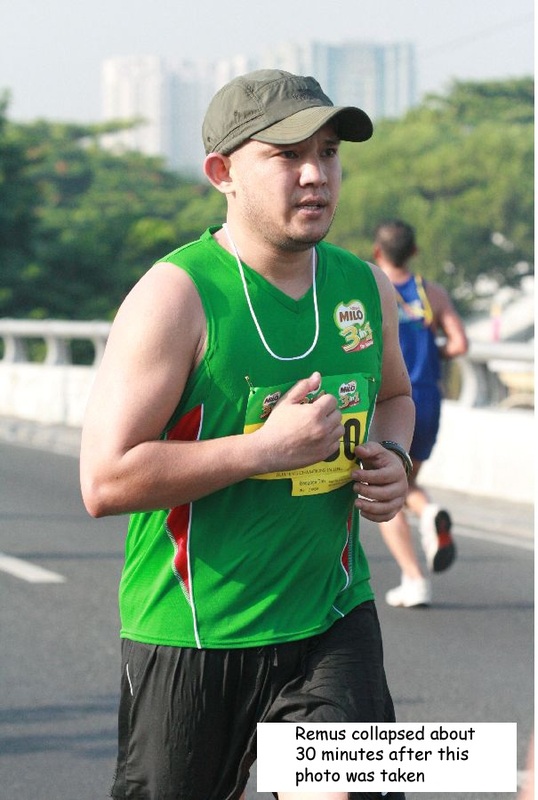 Sir Jovie, next week’s San Francisco Marathon that I’ll be running will be for Remus. This week, I’ve taken steps to be sure that I’m okay by having a complete physical done (last Tuesday) and getting a fuel belt (long overdue). Though the San Francisco Marathon has an ample number of water stations and the weather is generally cool, never assume that this will happen on July 25th. Also, I plan on wearing a green tech shirt (several reasons). Again, my condolences to the Fuentes family. a F#@$@%#$ reply from MILO…..
2 sponging stations, and 1 banana station strategically Iocated throughout the 13.5 km race loop. race path. These marshals were equipped to immediately contact first aid stations and ambulances with trained crew and rescue facilities. if mr fuentes does file a suit against the organizers, this will be a test case for the sport of running. this will remind the organizers that they have the responsibility of ensuring that race conditions are safe, provisions are adequate and enough emergency measures are in place should an accident occur. If Mr. Fuentes does file a case, the onus will be on his lawyers to prove criminal negligence on the organizers’ part (enough to nullify the waiver his son signed upon registering for the race). It’s still innocent until proven guilty. The way the wheels of the court system turn in this country, I think MILO and the Fuentes family will come to a settlement out of court. Running a race especially in a 21k or more, we are risking our lives. The brevity of life even if we are ‘seasoned’ runners is obvious. Death comes to us all, in varying age, time and situation. My deep condolences to the Fuentes family. And to Milo Organizers…this will serve as a wake up call to improve the system. Not because we have signed the waivers…the guilt will still be there if we neglected to do our duties, and that is, by providing runners the best stuff all the way to the finish line. The success of a race can be summarized by this: NO FATALITIES/CASUALTIES! rest in peace, brother… you will always be remembered. I ran that day, my first and might be my last MILO marathon. Milo disappoints me from “baggage” counter up to the race itself. My condolences to the Fuentes Family.